The sound that can only mean one thing compelled an army of readers to cheer Mark Millar and Steve McNiven's glory. It built over the course of seven amazing issues, and finally appeared on the third and second to last pages of Wolverine #72. In the story, "Old Man Logan," Wolverine lives in a future, with a small secluded family, which is lead by super-villains. The bad guys finally pulled forces and systematically took down the super-hero community. There are few heroes left alive, and in fact, along the ride of "Old Man Logan," we meet characters like Hawkeye (who is now fittingly blind), Emma Frost, and Black Bolt. Dead remains of heroes past including Giant Man, Thor (his hammer, Mjolnir), and others are encountered, as well. Wolverine lives on refusing to ever pop his claws and fight again. Mysterio destroyed Logan's will to fight when he tricked Wolverine into killing the X-Men. This graphic flashback scene is captured by McNiven in such excellent detail that when I think of a rampaging Wolverine I will always see this McNiven sequence. It is the interior equivalent to McFarlan's Incredible Hulk #340 cover. Who doesn't love a McWolverine? Now on the dollar menu! As the "Old Man Logan" tale continues into issue #72 Wolverine has a throw-down with the future president of the United States, the Red Skull. 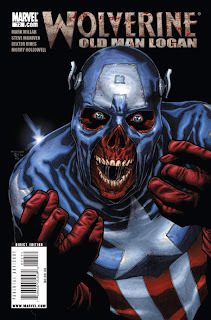 As Red Skull dons Captain America's uniform; Wolverine, still refusing to pop his claws, uses Captain America's shield to decapitate the Red Skull. After a long journey with old man Hawkeye (who was killed in issue #71), and the passionate battle against the evil high lord Red Skull, Wolverine jumps into the old Iron Man armor and flies back home to his family. In bold red letters, the word covers a two page spread. Funny enough "Old Man Logan" is dominated by an industry leading artist's work, yet all of McNiven's beautiful frames are out shined by letterer Cory Petit and his two page spread. McNiven quickly picks some ground back up on Petit when the page flips to the following panel where the known is realized. Logan's claws are out, his hands are bloody, and he is ready to kill himself some Hulks.